Use these 32 cards to practice working with prefixes. The set contains two types of cards. The first 16 cards require students to change a base word in a sentence into a new word by adding one of four prefixes. This will help your students to see how adding a prefix changes the meaning of the word. Reading and ELA Task Card Massive Bundle - 107 Task Card Sets! 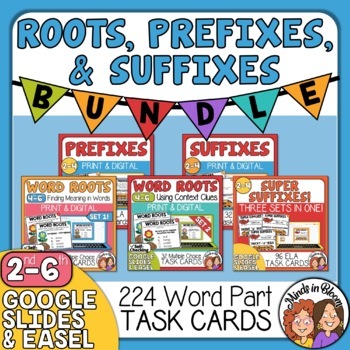 Save money with this discounted bundle of 7 Prefix, Suffix, and Word Root Task Cards! There are 224 task cards altogether! These sets are Common Core aligned with standards listed. All have challenge cards, student answer sheets, and answer keys. Please see the product links above or in the free preview for more information.